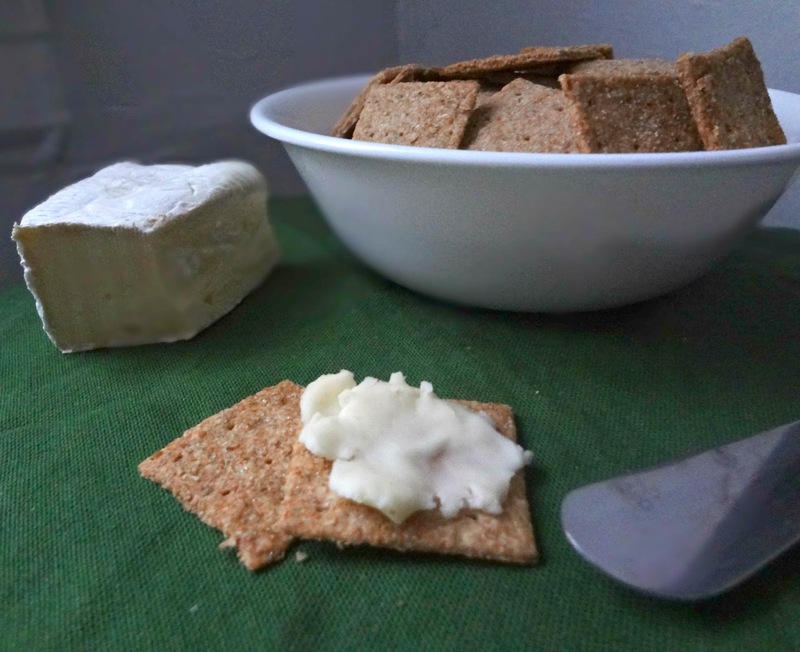 Look how fancy I am with my dim lighting and green base and brie spread on homemade crackers. I can now imagine I'm the type of person who always looks impeccable, not a stain in sight, no cookie dough in my hair, nothing out of place. My kitchen is probably immaculate (and not with tons of crumbs on the floor and dried dough of various sorts hiding in various different places). I probably always say the right thing, speak at the correct volume, and know when to be silent. My manners are undoubtedly above reproach and I never use my hands when I eat. I probably speak another language fluently, probably french. I've probably also been to Europe, and I have a super classy and important job. Ok soooo...none of that stuff is true. 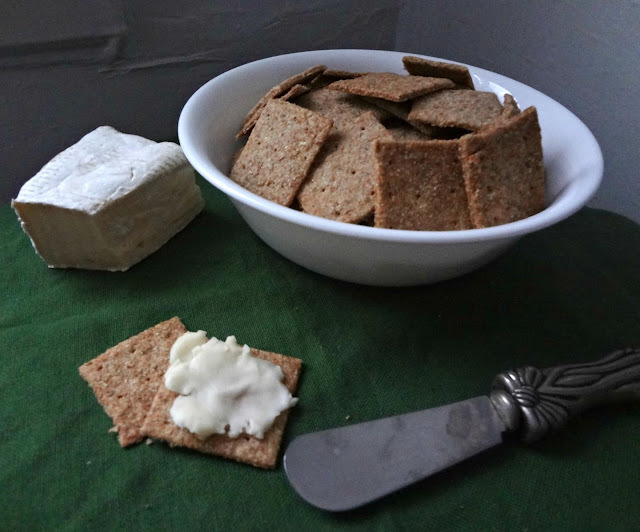 Except for the part about eating brie* on homemade wheat thins. I did that. And I'm cool with it, all loud, messy, annoying, crazy, improper parts of me. 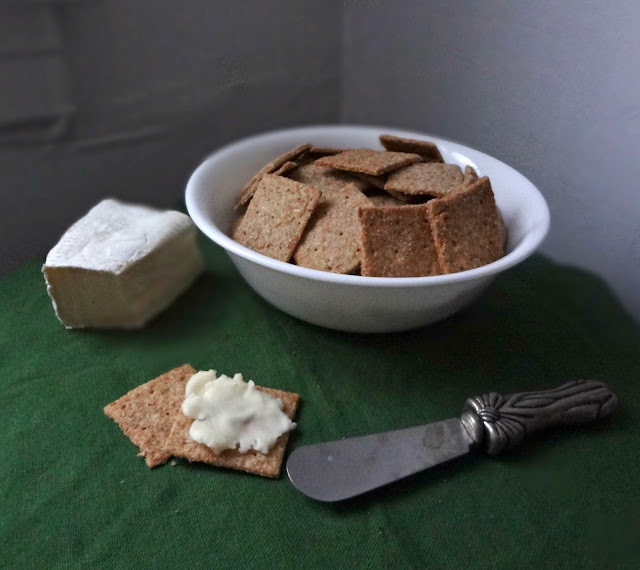 I'm sort of obsessed with homemade crackers these days. I just think things from scratch taste better. Forreals. And these do. AND they're like healthy and actually healthy, not like when you buy a box of something supposedly healthy at the store then look at the ingredients and go "WHAT IS IN THESE??!" You totally aren't gonna be afraid of anything in these. A perfect snack (or breakfast, if you're me)! If making by hand: Combine the flour, sugar, salt, paprika and butter in a medium bowl. Using a pastry blender or your fingers, work the butter into the mixture until mixture resembles coarse crumbs. Add 1/4 cup (60 ml) cold water, stir with spoon until combined. Knead once or twice on floured surface. Food processor method: In a food processor, pulse together the flour, sugar, salt, paprika, butter (and optional seasonings) until combined and the mixture resembled coarse crumbs.With the food processor running, drizzle the water in through the feed tube slowly, until it forms a ball. Preheat oven to 400 degrees. Lightly grease baking sheet(s) or line with parchment paper. Divide the dough in half. One half at a time, on a very well floured surface, roll the dough out into a very thin rectangle (frequently check to make sure it doesn't stick, use lots of flour to prevent it! If needed, you can re-roll out dough). Using a knife or pastry cutter/pizza cutter cut the dough into evenly sized squares (about 1 and 1/2 in.) 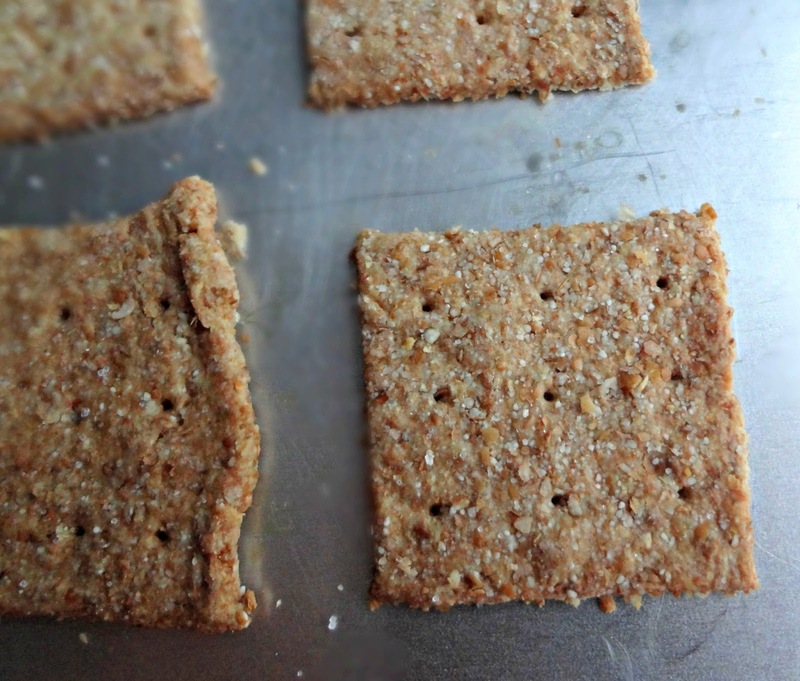 Dock crackers with a toothpick or the end of a thermometer. 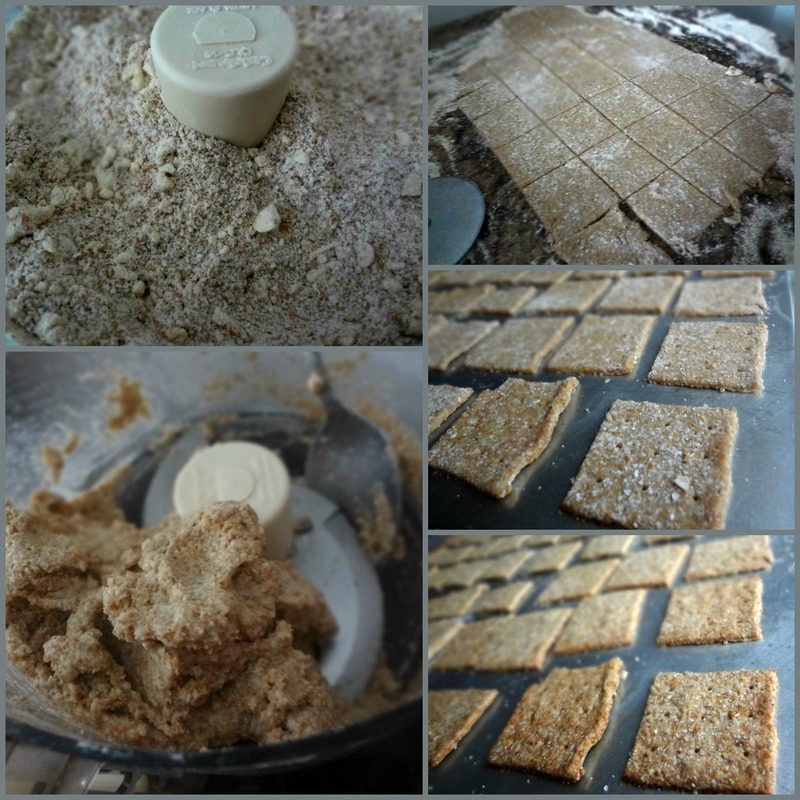 Place finished squares on baking sheet(s)-you don't need to leave much space between. Sprinkle with salt. Bake 5-15 minutes until crisp and bronzed (but not too browned). Let cool on pan. Store in an airtight container or freeze in an airtight container between sheets of wax paper.